A mezzotint of James II as king: bust length; wearing a wig, lace cravat, armour, and a sash over his left shoulder. Borders trimmed. Proof before lettering. For a later state see RCIN 602826. Abraham Blooteling's monumental mezzotints of James II when Duke of York, Charles II (RCIN 602538), and James, Duke of Monmouth, mark the pinnacle of mezzotint production during the seventeenth century. The print of Charles II is probably a finished state and how Blooteling intended his entire series to appear. The scale and quality of the mezzotints has led some to presume that they were created with royal sanction or that they were even a royal commission. 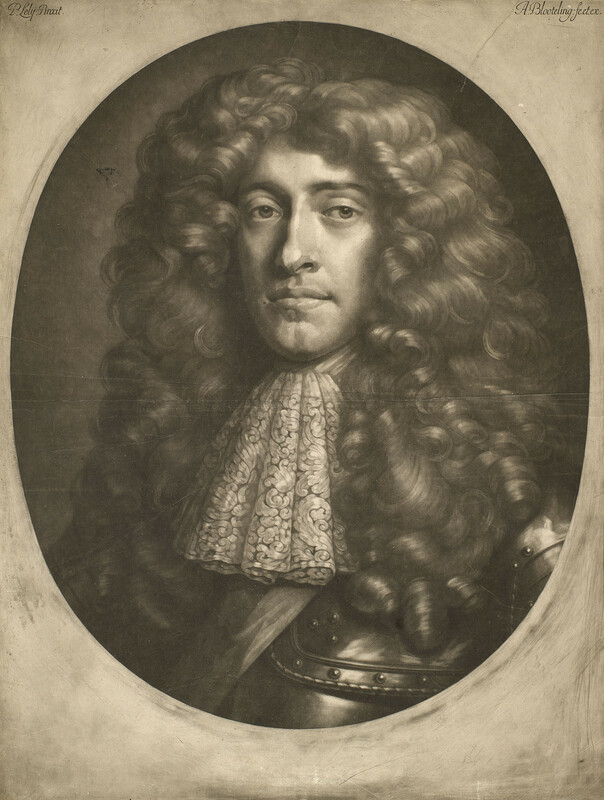 Following James II's accession to the throne in 1685, Blooteling reissued his mezzotint portrait of James, retaining the portrait but updating the lettering on the plate to declare James's new status as king. It is likely that the Royal Collection's impression was made as a reference proof in connection with Blooteling's work on the reissue. The plate was cut below the portrait to remove the earlier lettering which identified James as Duke of York. Blooteling also burnished out the laurel border to allow space for the new lettering.